L I V I A: [LESS IS MORE] PREMIUM ORGANIC BRAND FEATURING HAIRCARE AND STYLING PRODUCTS FROM VIENNA - TRAVEL SIZED BUDDIES! [LESS IS MORE] PREMIUM ORGANIC BRAND FEATURING HAIRCARE AND STYLING PRODUCTS FROM VIENNA - TRAVEL SIZED BUDDIES! Helios Health and Beauty recently announced the arrival of premium organic brand, Less is More - which is the first range of salon quality organic haircare and styling products from Vienna. And did I mention they also offer travel sized buddies which are refillable? Less is More was actually established in 2006 by Dr. Doris Brandhuber, Chemist and Aromatherapist and Hannes Trummer, Artistic Director and Staff Trainer at a prestigious hairdressing chain . 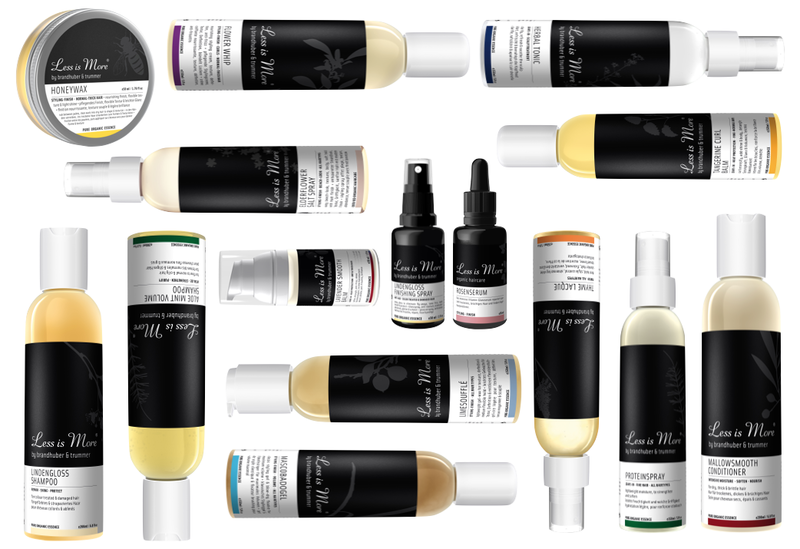 Their creation has seen Less is More growing rapidly with their "organic care" range and styling products. What makes them unique is that their formulas contain natural and organic ingredients that are gentle for all skin types. Also, they're made from Vienna! Furthermore, if you're looking to travel and wanting an organic range of hair care and styling products, then Less is More offers their adorable travel buddies. All of their travel sized products come in approximately 30ml and they're totally refillable. As they come in pump containers, all you need to do is twist and tug the upper white part gentle to separate the container and pump. Aloe Mint Volume - Shampoo - RRP $10 - The scent smells organic and refreshing and where it's of a sulphate-free formula. It also looks to boost volume for fine to normal hair. If your hair suffers from greasiness by the end of the day, you're going to love trying out this refreshing shampoo for a change. As it's less than 30ml, it's a great product to have in your bag if you love to carry light. Aloe Mint Volume - Conditioner - RRP $11 - The conditioner is perfect for fine, normal or oily type of hair. This product really looks to strengthen and add body to the hair. The product also contains 100% organic essences which really look to deliver an aromatic experience. After using this conditioner, I could feel really the softness to my hair which was quite satisfying. Angelroot Volume - Spray - RRP $13 - Looking for a spray that's heat activated and is made for all hair types? The Angelroot Volume spray is ideal for those who wish to have more volume to their hair as it has a root-lifting booster which creates maximum volume without weighing the hair down. After using this spray, I could really notice a beautiful shine to my hair. Thank you Less is More for supporting me for this review. My reviews are based on my personal and true experiences. I only recommend products that I truly support.